Aboard the papal plane (AFP) – Pope Francis said fundamentalism is “a disease of all religions”, including the Roman Catholic Church, as he returned from a three-nation tour of Africa in which he preached reconciliation and hope. “Fundamentalism is always a tragedy. 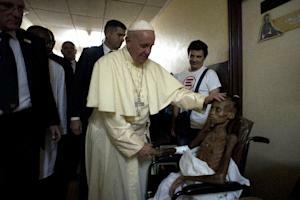 It is not religious, it lacks God, it is idolatrous,” the Argentine pontiff told journalists on the plane back from the Central African Republic. 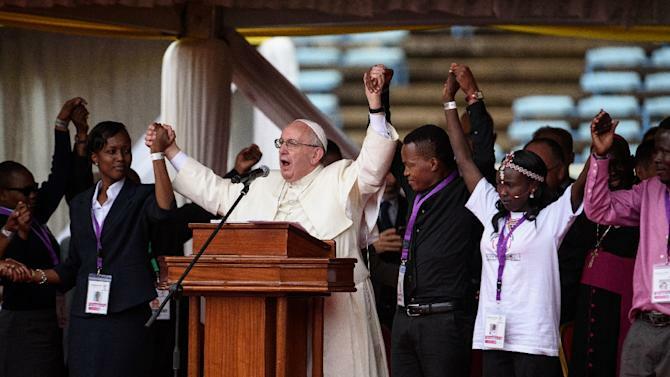 There, on the final leg of his first trip to Africa, the leader of the world’s 1.2 billion Catholics called on Christian and Muslim “brothers and sisters” to end the sectarian conflict that has torn the country apart. He was given a rapturous welcome by thousands of people as he visited a mosque in the flashpoint Muslim PK5 neighbourhood of the capital Bangui, on what was the most dangerous part of his 24-hour visit to the country. “Together, we must say no to hatred, to revenge and to violence, particularly that violence which is perpetrated in the name of a religion or of God himself,” he s aid. Speaking later in the day as he flew back to Rome, Francis said Islam was not the only religion to suffer from violent extremists, such as the ones behind the deadly attacks in Paris which were claimed by the Islamic State. Francis also visited Kenya on his trip, where he denounced the radicalisation of young people, citing “barbarous attacks” by Islamic extremists in Nairobi, Garissa and Mandera. The country has been hit by numerous deadly attacks since sending its army into neighbouring Somalia in 2011 after a string of kidnappings it blamed on Al-Qaeda’s east Africa branch, the Shebab. In Uganda, huge crowds celebrated as he honoured Christians martyred for the faith and hailed Africa as “the continent of hope”. 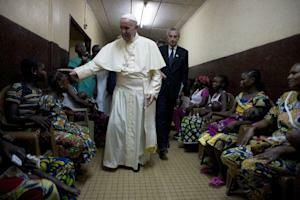 But it was in Central African Republic, torn apart by brutal violence between mostly Muslim rebels and Christian militias for more than two years, that his visit appeared to have made the most powerful impression. In extraordinary scenes before he held a papal mass at the capital’s Barthelemy Boganda stadium, a group of Muslim rebels from the PK5 area leapt out of two pickup trucks, all wearing T-shirts bearing the pope’s image. As they pushed through the crowd in an area where Muslims usually do not dare to venture, people cheered and shouted: “It’s over”. “We thought the whole world had abandoned us, but not him. He loves us Muslims too,” said Idi Bohari, an elderly man. The landlocked Central African Republic descended into bloodshed after longtime Christian leader Francois Bozize was ousted by rebels from the mainly Muslim Seleka force in March 2013. The coup plunged the former French colony into its worst crisis since independence in 1960, and more than 100 people have been killed in the capital since late September alone.